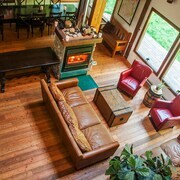 Located in Kootenay Boundary B, this ski bed & breakfast is steps from Big Red Cats and Red Mountain Resort. Rossland Museum is 2.7 mi (4.3 km) away. Liked the liquor store attached to it and the breakfast. Where to find Fruitvale hotels near an airport? Where can I find hotels in Fruitvale that are near tourist attractions? 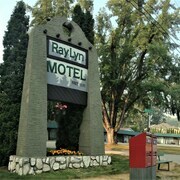 Arranging several nights in Castlegar and want to stay in central Fruitvale? About 2 hotels and apartments lie within a 0.1-kilometre (0.06-mile) distance of Fruitvale's center. There are only a small number accommodation options within an easy walk from the center of Fruitvale. The Villager's Inn is an ideal choice as it's only 3 kilometres (2 miles) away. 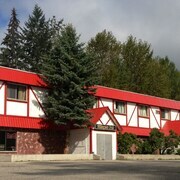 You could also check out the Super 8 Castlegar BC as well as the Genelle House B&B Guest House. 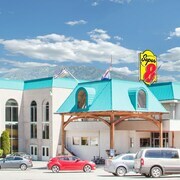 The Super 8 Castlegar BC is situated 25 kilometres (14 miles) from the center of Fruitvale. The Genelle House B&B Guest House, is 16 kilometres (10 miles) away. 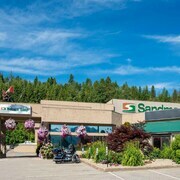 Two other options in the area include the Canadas Best Value Inn & Suites and the Sandman Hotel Castlegar. After you have enjoyed Fruitvale, you could set out visit the wider region of the Kootenay Rockies area. If you're a nature lover, be sure to explore Kootenay Rockies' rivers, streams and lakes. You could also explore its art museums and history museums. Fun-loving visitors may also try snowboarding and skiing in this part of Canada. Rossland is 20 kilometres (12 miles) to the west of Fruitvale and is home to the Red Mountain Resort and Red Chair. 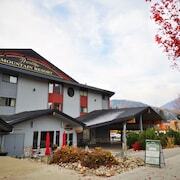 If you'd like to stay in Rossland, check Expedia's booking pages for the latest deals at the Prestige Mountain Resort Rossland and Casa Alpina. 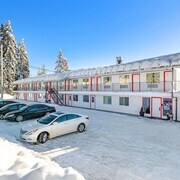 Alternatively, you could stay in Trail, 11 kilometres (7 miles) to the west of Fruitvale, where you can pick from the Glenwood Inn & Suites and Best Western Plus Columbia River Hotel. Whether you're just passing through or staying in Trail, a couple of places to add to your itinerary are the Trail-Rossland Country Club and Gyro Park. Get your sporting fix by taking a journey to Johnny Bucyk Arena, which is 75 kilometres (46 miles) to the east of Fruitvale. 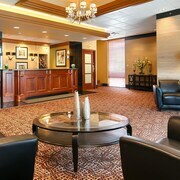 Book a hotel close to the action at the Ramada Creston or the Sunset Motel. Taking a flight to or from Fruitvale? The most convenient airport is Trail Regional Airport, 8 kilometres (5 miles) from Fruitvale's center. Stay close by at the Columbia Gardens Winery and Grape Escape Guesthouse. What are the most popular Fruitvale hotels? Are there hotels in other cities near Fruitvale? 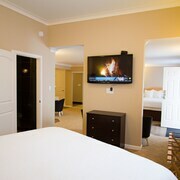 What other types of accommodations are available in Fruitvale? Explore Fruitvale with Expedia.ca’s Travel Guides to find the best flights, cars, holiday packages and more!